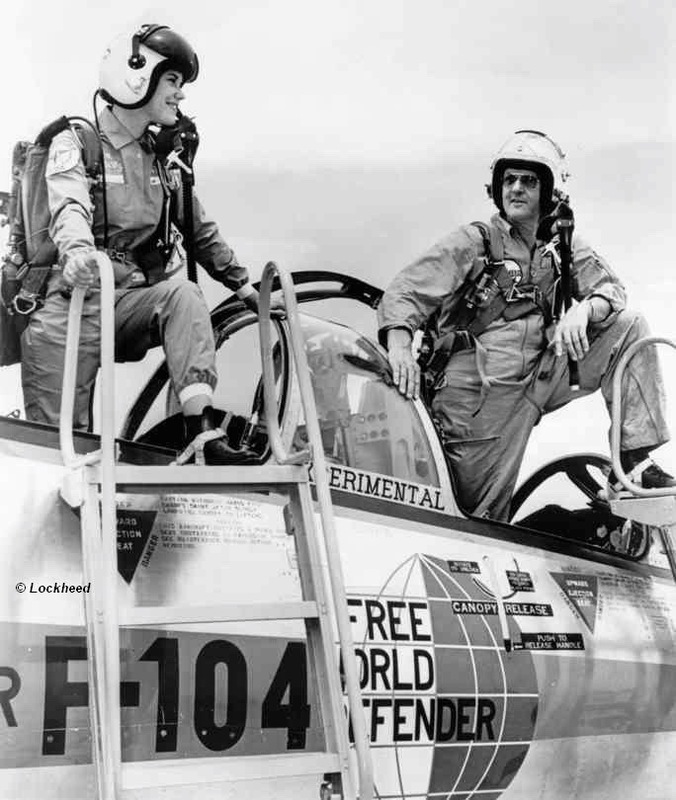 29 May 1963: Lockheed Test Pilot Anthony W. “Tony” LeVier and his 18-year-old daughter, Toniann LeVier, flew the company’s two-place TF-104G Starfighter demonstrator, FAA registration N104L, from Air Force Plant 42, Palmdale, California, to Andrews Air Force Base, Maryland. They made fuel stops at Kirkland Air Force Base, Albuquerque, New Mexico, Tinker Air Force Base, Oklahoma City, Oklahoma, and Wright-Patterson Air Force Base, Dayton Ohio. PALMDALE, Calif. — Toni Ann LeVier, 18, recently earned the title of World’s Fastest Teen-ager after a scorching Mach 2 (twice the speed of sound) flight in the front cockpit of a Talley Corporation equipped TF-104G Super Starfighter. The back-seat driver of the Lockheed aircraft A.W. (Tony) LeVier, her father. The teen-age fledgling flier handled the TF-104G controls during the Mach 2 dash. Flying the stub-wing fighter was a giant step for Toni, who holds a student pilot’s license. She started flying lessons in January and has 35 hours in a Beechcraft Musketeer light plane, whose docile 140-m.p.h. speed is about one-tenth that of the TF-104G. The company-owned TF-104G they flew is being assigned to Andrews AFB near Washington for a series of demonstrations to U.S. Air Force officials. Toni volunteered to help Pop ferry the airplane on the cross-country hop. They plan to leave Friday morning. Stops are scheduled at USAF bases at Albuquerque, Oklahoma City (where they will remain overnight after a noon arrival), and at Dayton, Ohio. Toni is no stranger to military bases. She was named “Miss Starfighter” by F-104 pilots of the 479th Tactical Fighter Wing, George AFB, Calif., for Armed Forces Week. at Andrews AFB Saturday the LeViers will turn the 1500-m.p.h Super Starfighter over to a Lockheed Demonstration team. Then — for Toni — it’s back to flying a school desk. — Oxnard Press Courier, Tuesday, 4 June 1963, Page 4, Columns 1–3. 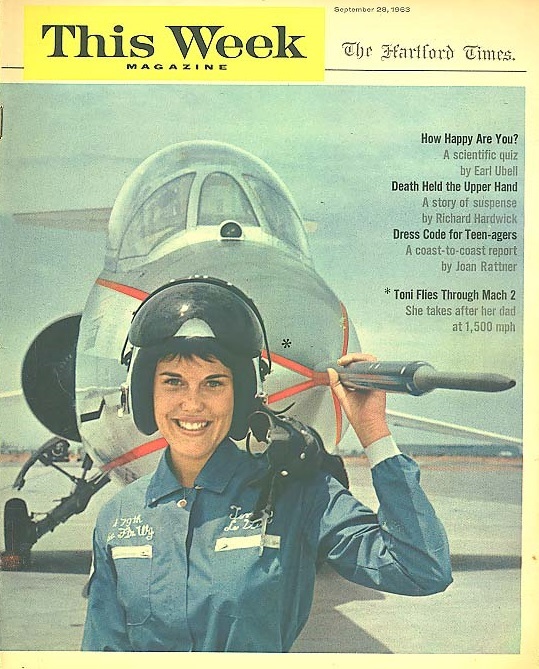 Toniann LeVier on the cover of This Week Magazine, 28 September 1963. Toniann LeVier was born 21 September 1944 in Los Angeles County, California. 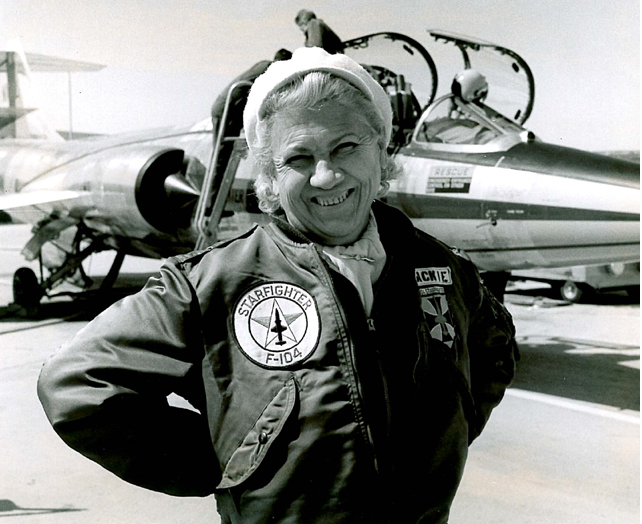 She was the first of two daughters of Anthony W. (“Tony”) Levier, a test pilot for Lockheed in Burbank, California, and Neva Jean Ralph LeVier. Miss LeVier attended John Muir High School in Pasadena, California, where she participated in the Adelphians, the Civil Affairs Council, Fine Arts Council and the Senior Class Council. She graduated in 1963. Later, she studied at Cabrillo College, Aptos, California. Miss LeVier married David M. Logan, a real estate agent from La Cañada, California, on 11 July 1964. On 24 June 1978, she married her second husband, Theodore E. Posch, in Orange, California. On 21 June 2003, she married Richard Samuel Almaz, a chef, in Las Vegas, Nevada. Today, Mrs. LeVier-Almaz works as a massage therapist. She and her husband live in Aptos. N104L, originally registered N90500, was retained by Lockheed for use as a customer demonstrator to various foreign governments. In 1965 Lockheed sold N104L to the Koninklijke Luchtmacht (the Royal Netherlands Air Force), where it served as D-5702 until 1980. It next went to the Türk Hava Kuvvetleri (Turkish Air Force), identified as 4-702. The record-setting Starfighter was retired in 1989 and after several years in storage, was scrapped. “The 100 kilometer closed course was so damn difficult. Imagine an absolutely circular racetrack, about a quarter of a mile wide, on the ground with an inner fence exactly 63 miles long. Now, in your mind’s eye, leave the track and get into the air at 35,000 feet. Fly it without touching the fence in the slightest. It’s tricky because if you get too far away from the inner fence, trying not to touch, you won’t make the speed you need to make the record. And if you get too close, you’ll disqualify yourself. She had flown this same F-104 to an earlier speed record at Edwards Air Force Base, 12 April 1963. N104L was retained by Lockheed for use as a customer demonstrator to various foreign governments. 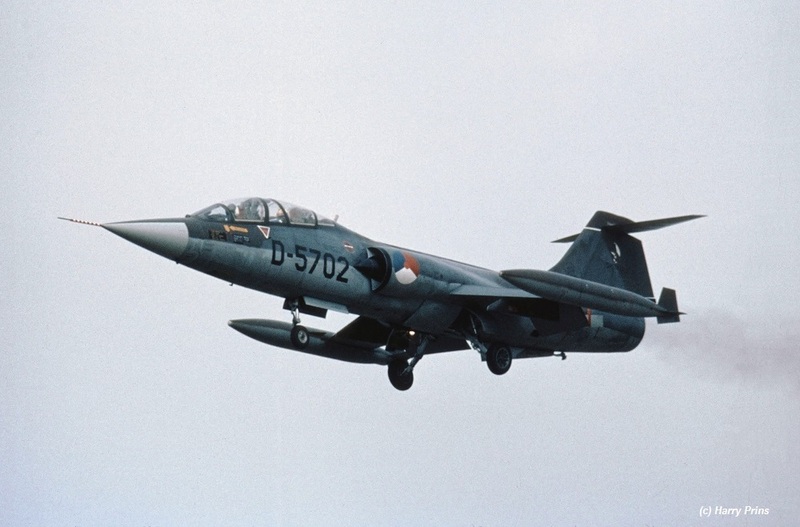 In 1965 Lockheed sold N104L to the Dutch Air Force, where it served as D-5702 until 1980. It next went to the Turkish Air Force until it was retired in 1989.